Nearly ten yards of fabric woven, sewn and hemmed, and hanging on my bedroom windows. I haven’t ironed this much since I wore silk blouses to work in the 1990s. Ellie usually finds a way to sit on newly woven fabric. I’m sure she thinks it is her right. She was determined to get cozy on all that white and pestered the heck out of me after the fabric came off the loom. When I unrolled the soon-to-be-curtains from the cloth beam and all those sticks hit the floor, The doggie was there in a flash. And then, when I ironed the cloth after its initial washing, that little pest hovered beneath the ironing board. I had to give her a dozen treats to distract her. Click on this photo for a closer look at the lace. After I finished the sewing and gave the curtains their final ironing, Ellie did manage to find her way onto the sheets I put below the ironing board to keep the fabric off the floor. I hadn’t the heart to tell her she wasn’t reclining on the real thing. Thanks so much. Everything came out like it was supposed to, so I’m very happy with the project. 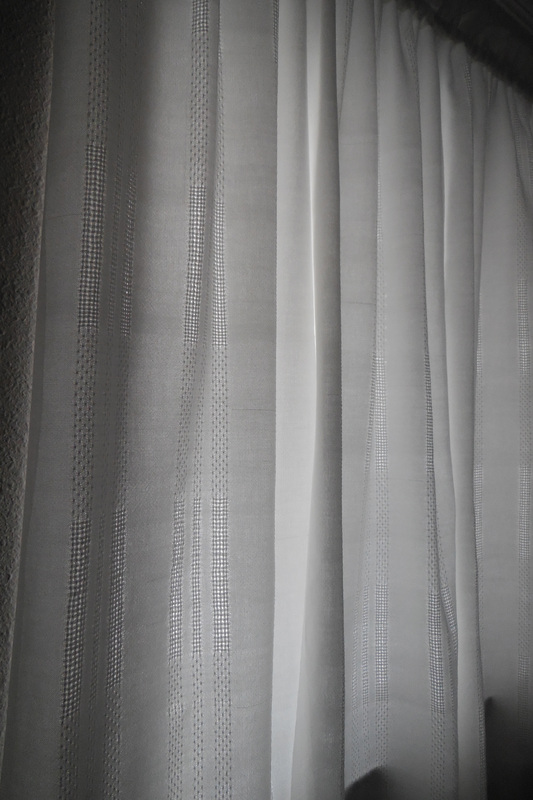 Your curtains are lovely and you’ll be able to enjoy them every time your in that room. Thanks, Barb, Even after all the weaving, I’m still in love with huck lace. What an amazing accomplishment! 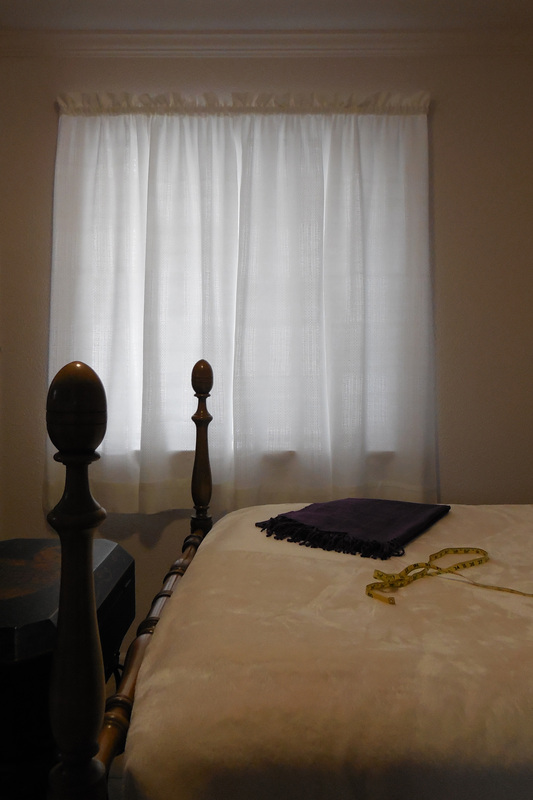 And the huck is perfect for curtains. Thanks, Jen. I really like this lace. 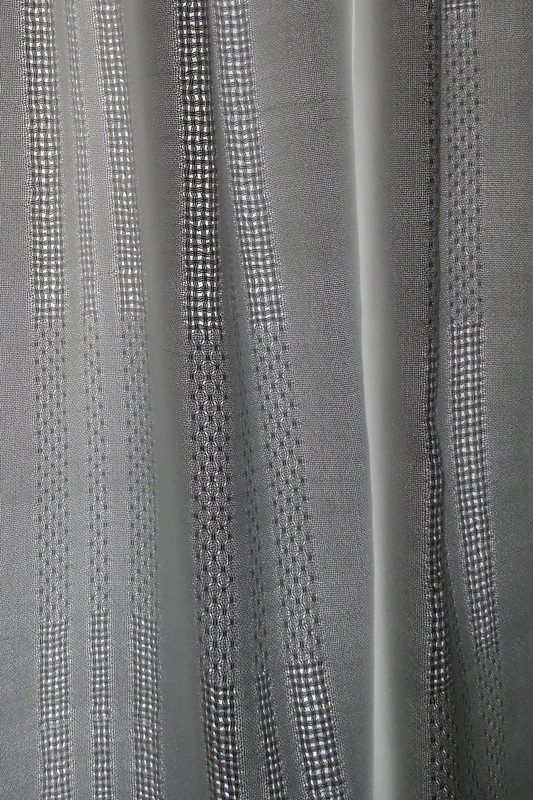 At some future point, I would like to make yardage for a blouse using the more closed huck weave I used on the curtains. Remind me what loom you are using at the moment? Jen, my floor loom is an old LeClerc Nilus with four harnesses and a 45″ weaving width which I bought nearly two years ago. It had some interesting issues when I got it. Some I knew about and others I found as I learned to weave. (See my blog article, Loom Remodeling Job). Eventually, I’d like to have an eight harness loom, but there still is a lot to learn on this one. Luckily, I have some excellent resources. My little sister is a master weaver, and although she lives far from me, she is as close as Skype on which we can compare notes and troubleshoot problems. Also, I have just about every weaving book from the recognized masters: Davison, Black, Atwater, Redding, the Collingwoods, and many of the younger experts. Thanks Julz. I am really loving these curtains. This was not a physically easy weave since part of the pattern requires a treadling series: 1 treadle raising 1 shaft, then another treadle raising 3 shafts. However, I love this weave and next time I do it, I’ll tie the treadles up so the one raising 3 shafts is powered by my dominant leg. Maybe that will be easier. Most every loom has its limitations. They probably are made that way so we will always hanker for something we cannot quickly achieve. I have designed some inkle “pick-up” patterns which are too wide for my little inkle loom and would love to have a rigid heddle loom for weaving them. I appreciate the sewing artistry as a fellow fabric lover, but I am in awe of your weaving – it is perfection! Thank you, Phyllis. All the girls (4 of us) in my family worked with fabric from very early ages. As the eldest, I helped teach the younger ones. It was up to me to see the work was done right. I was a tough taskmaster. Each of us began with doll clothes and went on from there. One of my sisters (my youngest) became an accomplished weaver and recently taught me to weave. With the tables finally turned, my work has to be done to suit her or she may not help me in the future. Absolutely. It is mind jolting to realize your baby sister knows anything, let alone is an expert in something you know nothing about.